Mary and I praise God, and we also thank you because through our partnership with you in Dynamic Churches International we have seen God change so many lives, families, churches and communities. 2019 is off to a great start and it could be another record year! The recent Mission trip to Bangkok, Thailand and India has provided new opportunities for ministry. Plans are being made to expand the DCI work in Thailand, Bhutan, India, Indonesia, Philippines, Haiti and 18 countries in Africa plus begin in 6 new countries there. 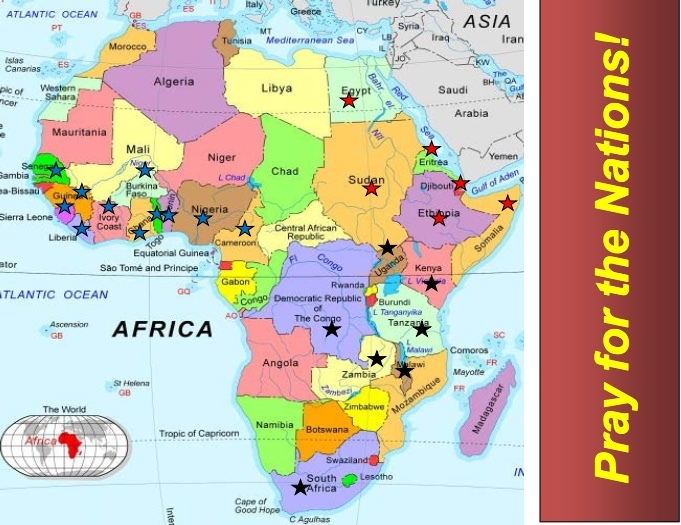 Dr. Simeon Oyugi our African Director – established 11 new countries in West Africa in 2018. He now has Regional Directors, National Directors, Area Directors and Community Trainers in place in a total of 18 countries (plus) in Africa. Each week they are conducting Spontaneous Disciple Making workshops in Churches to equip their people to reach out into their community, and they are sharing the gospel and discipling their families and friends through Discovery Groups. God continues to grow His Church! Invitations and requests continue to come in for our ministry. This month Simeon is planning a similar trip to the one he did in West Africa, this time for pastors in Ethiopia, Egypt, Sudan, Djibouti, Eritrea and Somali in North East Africa. In March he is invited to return to Uganda, Cameroon and Tanzania for one week. In April he will be going to Zambia for three weeks to train 200 Pastors plus church leaders in our Spontaneous Disciple Making Ministry. We are a very small ministry compared to many others, but God is accomplishing amazing results! Why? Many people have told us that they pray for us every day! I also believe that the structure that God gave us to use is a big factor. We are working primarily though volunteers. Pastors and Church Leaders, even Denominational Leaders have caught the vision (they own it) and they are working together as ONE CHURCH, training each other even across denominations because they are committed to fulfilling the Great Commission in their communities. They are also seeing the results of our ministry and lives are being transformed as they learn to let Jesus live through them! I am writing to you today to encourage you to pray for Simeon as he goes into these countries in North Africa. There is very strong religious opposition there and he could be in very serious danger! As the ministry continues to grow and expand into new areas, it also requires an increase in finances. Simeon will need $13,200 for Travel, Accommodations and Printing of Materials for the above 3 trips. You may want to invest in reaching Africa by equipping disciples in the Churches there. (Any amount toward meeting this $13,200 need would be greatly appreciated). Donations can be mailed to the addresses below or via bank e-transfer to dcimiddleton@shaw.ca or online using a credit card at: http://www.canadahelps.org in Canada or http://www.networkforgood.org/donate/ in the U.S. Dynamic Church international à été reçu avec triomphe ici encore côte d’Ivoire malgré que nous ne connaissons pas les fondateurs encore. Oui avec la grâce de Dieu DCI fera de grands exploits dans cette nation. À travers l’adhésion massive des planteurs d’église qui arrivent tous les jours,les âmes seront gagnées à Christ.